In breaking news, US Footy have announced that legendary Essendon Bombers coach Kevin Sheedy will speak at the 2004 US Nationals banquet. The full story follows, and worldfootynews.com will have all the details of the Nationals in a pending story, once divisional seedings have been completed. The following is a release from US Footy, regarding the tournament banquet. The USAFL Executive Board is pleased to announce that after some heavy negotiating and some much needed sponsorship from Pratt Industries, the USAFL has obtained Kevin Sheedy, one of the most well known and most decorated coaches of our game in Australia to attend the "Pratt Industries 2004 USAFL National Championships" as our special guest. Kevin is currently the Head Coach of the Australian Football League (AFL) team, the Essendon Bombers. Essendon is one of the USAFL's biggest supporters. Over the past five years Essendon has accepted a USAFL player to train with them in Australia as part of our scholarship programs in the attempt to develop skills within our USA born players. 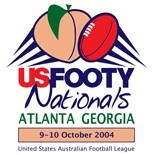 Kevin will speak at the "Qantas 2004 USAFL Nationals Banquet" held at the Marriott Perimeter Center on Saturday the 9th of October and will also present the Premiership winning cups to the teams on Sunday at the grounds. Kevin will also attend the coaches and team managers meeting on Friday night offering some last minute advice to all our USAFL coaches. For your chance to hear one of Australia's best legendary coaches of the game, get your tickets as soon as possible, first in best dressed, and they are selling fast! With only 400 available seats this is a lifetime opportunity that may not roll around again, contact officemanager@usfooty.com for details.